Amanda Adele Lederer, Carol Uraneck, Eliza Simpson in THE WOODSMAN. Photo by Hunter Canning. BOTTOM LINE: Bunraku puppetry executed excellently to tell the heart-wrenching story explaining the origin of The Wizard of Oz's Tin Man. Voices like silk, transitions smooth as butter, and movements that breathe life into inanimate objects. All is present in this representation of the writings of L. Frank Baum, by James Ortiz. With an onstage violinist and Bunraku puppets the ensemble shines as a strong unit telling a simple story in a beautiful way. This unique performance is unlike others you might encounter, but in a wonderful way. It was unexpected and I did not want it to end. Some people are familiar with the origins of The Wizard of Oz's characters, but many are only aware of the section L. Frank Baum wrote surrounding Dorothy. The Woodsman is the demonstration of events leading up to the creation of the character we know as The Tin Man. It all begins in the land of Oz where the Wicked Witch of the East rules through fear. A woodsman and his wife have a child named Nick. This carefree boy falls in love with Nimmee, slave to the witch. Such a wicked woman, she curses his ax so it chops off his own limbs when he uses it. With each attempt at cutting wood his body parts are replaced with the tin limbs that earn him his ubiquitous name. Despite such a dark plot, Ortiz (as writer, performer, and director with Claire Karpen) finds moments to insert bits of humor. The importance of this cannot be understated because though it is such a simple plot there is a never-ending supply of gut squeezing entertainment for your senses stemming from deep passion and intense feelings. Nick and Nimmee even engage in a kiss that made me melt into a puddle of drooling mush. The ensemble is a cohesive unit that drives the show. Such elements as bird song, the chopping of wood, and the noises from the puppets are all created from every performer onstage immersing the audience into the deep emotions present at every turn. Even breaths are a group activity, which assist in the manipulation of the puppets and rearranging branches and boxes for varying environments. Bunraku puppetry is a Japanese style. The puppets are much more detailed than others and rather than strings, they have solid extensions for multiple people to manipulate them (which allow for such specificity of movement as making a fist). Only two main aspects in this show differ from the traditional Bunraku. Customarily the puppeteers are in black cloaks. I feel with the steadfast commitment to each puppet the performers did not lose anything by not abiding by that general rule. In addition, the stringed instrument used in this performance was a violin, rather than a traditional Japanese instrument, but Edward W. Hardy's playing served as a gorgeous undertone of audible emotions. The themes present in this production are everlasting. A heartbeat tune keeps the characters working and loving and growing. It reminded me of Matthew McConaughey's recent role in The Wolf of Wall Street; a soft pounding on the chest and enticing melody flows in and out of our interactions with those we love. Through that beat of life we are reminded to pound on, fulfill our promises, and open our hearts to new experiences. Despite a lack of dialogue, tunes, chants, and songs communicate everything necessary for the audience to gather from the production. 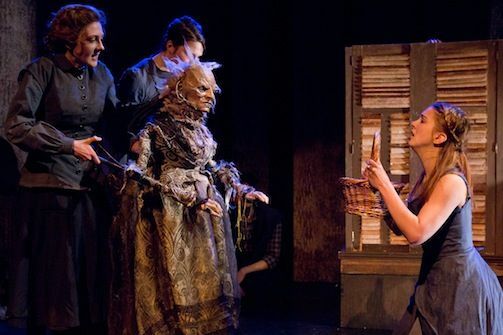 A variety of things can be taken away from this show, whether you are simply a fan of L. Frank Baum's stories of Oz, are interested in seeing Bunraku puppetry, enjoy a dark plot, or are looking for a new and interesting performance. Whatever you might be looking for to entertain you tonight, I think it is highly likely you just might find it in Theater B at the 59E59 theaters. The ensemble cast includes Benjamin Bass, Devin Dunne Cannon, Amanda A. Lederer, Will Gallacher, Aaron McDaniel, James Ortiz, Eliza Simpson, Meghan St. Thomas and Carol Uraneck.